This bowl is everything! Simple, savory, easy to prepare, makes enough for a crowd or extras for the next few days and tastes amaaaazing! 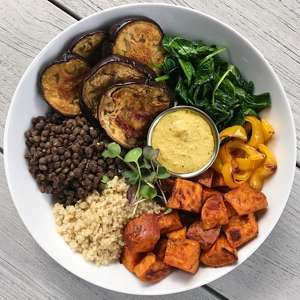 The inspiration for this bowl comes from Clean Eating Magazine who introduced us to this cashew cream and curry sauce as well is this simple way to prepare the yummiest lentils. A simple, savory and amazingly flavorful plant-based meal! The quantities below will make 4 bowls or give you extras for the next few days. Lentils, Cashew Cream and Curry Sauce adapted from Clean Eating Magazine. This was amazing!!! And so easy! So happy you loved it too! Isn’t the cashew curry sauce amazing? !